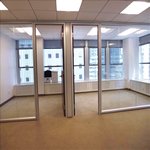 Garment District Office Space NYC; commercial real estate by listing including photos, floor plans, comprehensive property details + more, search today tour tomorrow. 42nd St. to 34th St., Ninth to Fifth Ave.
From Herald to Times Square – the area between the two locales is known as the Garment District (i.e. Fashion District), a densely populated neighborhood which stands less than one square mile and once served as home to many fashion manufactures. This district contains many showrooms which have primarily replaced the manufacturing tenants of yesteryear. The neighborhood still focuses on all facets of the fashion industry; from design to sales – no other metropolitan area boasts such an applied use of business and talent in real estate. The Garment District is served by many groups which strive to maintain the area’s vibrancy and relevance in today’s economic world. The primary organization spearheading the effort is called The Fashion Center Business Improvement District (aka Fashion Center BID), a non-profit which works to promote both fashion and non-fashion businesses alike. 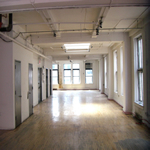 As fashion-industry tenancy declines many commercial properties have begun converting lofts and large open floor plates into showrooms and smaller offices, the latter of which has been occupied by a variety of businesses such as tech spheres that are migrating north from their traditional Silicon Alley corridor. Recent real estate analysis has shown that over 50% of businesses now are non-fashion oriented. There has been a substantial upsurge in communications, finance, and healthcare providers to the area which has become coveted by smaller companies / industries. This neighborhood due to its manufacturing history enjoys a healthy supply of commercial lofts either for lease or sale. In addition many landlords have installed brand new systems, while preserving and enhancing the loft-style aesthetic, including original hardwood floors, exposed ceilings and open-architecture collaborative workspace. The neighborhood enjoys a bevy of transportation options which are easily accessible and conveniently located including; Penn Station (NJ Transit & LIRR Service) and the nearby Grand Central Terminal at East 42nd Street. 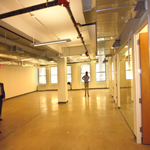 Located on 39th Street & Seventh Ave this Class B office building is an ideal space for a startup fashion company. The building has onsite property management, state of the art elevators, 24/7 lobby attendant closely located in between Penn Station and Time Square. This chic creative shared environment is perfect for your new business. It is configured of concrete floors, sleek glass front showrooms with a shared pantry and other shared amenities. The term is flexible as well as the sizes ranging from 300 SF – 1200 SF. The following space is a brand new prebuilt across the street from Penn Station on 34th Street and Seventh Ave. 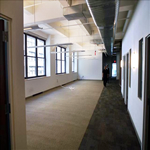 This building features a brand new renovated lobby, 24/7 tenant access, conveniently located near Penn Station and the Port Authority. 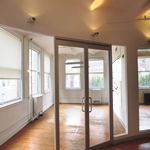 This space on the 20th floor at 1659 SF can be used as a showroom or your typical office space. It’s a corner suite which features a reception area, 2 offices and conference room with an asking price of $39 PSF. The following listing features a newly renovated commercial space ready for occupancy. Inside, your staff and clients alike are greeted by a newly renovated reception area (desk and seating). Move further in and the office spaces opens up featuring an incredible open workspace that includes an abundant number of windows (operable windows for added convenience) allowing for a copious amount of natural light; in addition this space is serviced by new bathrooms, and pantry. This commercial loft space is convenient to the area’s excellent public transport links offering an option to the PATH Train to New Jersey nearby! Located in the heart of the garment district, this large L shaped loft comes with large windows, polished wood floors and one private office. This attractive space is idyllic for a showroom tenant with many walls and space to display merchandise. Large double-hung operable windows allow for plenty of natural light in addition to the pendant lighting installed throughout this space. Furthermore the showroom herein also boasts a small kitchenette area and a pantry closet. The building offers a 24 hour automatic freight; allowing maximum flexibly in your schedule. 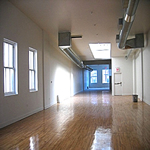 The loft space can work for other types of creative businesses, or any professional business use. Call for Pricing or Fill Out Form for pricing details! The following listing features a creative swing space containing high exposed beamed ceilings and a finished load bearing concrete floor. This commercial space enjoys excellent light and views due to its high floor within the building itself. In total this listing comprises of 2 interior private offices, 2 glass-enclosed private offices, 1 conference room (seats 8), an open work space / bullpen, reception area with seating and wet pantry. 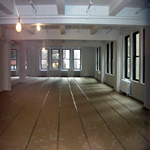 This loft is an ideal option for any tech or showroom usage requiring a Manhattan west-side location near silicon alley or the fashion designers (apparel, accesory showroom) in the Garment District. This office space consists of four perimeter private windowed offices, open work space that can accommodate over 10 workstations with good neighborhood views. This can be available whether you are looking for a short term rental or a 10 year occupancy - the lease for this space is flexible from 3-10 years, do not hesitate to contact us to learn more about this amazing space. The Garment District in NYC is recognized as one of the “Big Four” principal fashion capitals in the world along with London, Milan and Paris. Today there is a broad mix of businesses whether you’re an entertainment, production, technology or fashion company. If there is a fashion capital of the United States - it is located in the Garment Center in Midtown Manhattan; located on the South East Corner of 41st Street. The following listing is for a commercial space within a prestigious Class B accessories showroom building that has undergone a multi-million dollar renovation (lobby, elevators and common areas have been upgraded), offering a far superior profession image for your company. 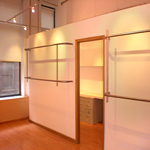 The building property when coupled with the available 3700 SF of space - makes for a perfect boutique showroom or a tradition office space; currently configured into a wide open plan with wall of windows facing 41st Street, addtionally the previous tenant used the space for a showroom and now offers plenty of closets. Penn Plaza Sublet Office for Rent 6,000 SF. / $38 SF. 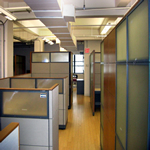 The following listed sublet is for a shared law office space in a Class-A office building that is located directly across from Penn Station. The space offered is in brand new condition and move-in ready. The office itself comes fully furnished with desks, chairs and filing cabinets, furthermore this sublease rental includes shared use of the conference room. Shared conference room space is available (according to schedule) and there is a full kitchen with seating area available to the subtenant. This available office contains polished wood floors throughout and a conference room enclosed in glass. This shared law office space offers an immaculate space with trim; wall covering and flooring are all above standard. IP Phones can be included by request - though subtenant is responsible for their own internet access. Corporations Headquarters in the Area: Abelson Company Productions Inc, AMA Consulting Engineers P.C., AMJ Industries Inc., Big Apple Visual Group, Breakaway Courier Systems, Calvin Klein, Carolina Herrera, Cortel Business Solutions Inc., Daytop Village Inc., Donna Karan Company LLC, Donna Karan International Inc., EVA Airways, First National Bank of New York, Floorworks Inc., Gotham Bank of New York, Gotham Writers' Workshop Inc., Haier America Trading LLC, Karbra Company, Marc Jacobs, Macro Risk Advisors, Messier Maris & Associates, Mindshare, Modell’s II Inc., Oscar De La Renta, PARS International Corp., Pearl Studios NYC, Ralph Lauren, Rockawear, S. Rothschild and Company Inc., SAI International Inc., The Segal Group Inc., Terjesen Associates Architects PC, Victoria's Secret Design Studio, Warnaco Group Inc. as well. Nearby Landmarks: Greenwich Savings Bank Building, The Fashion Walk of Fame, Needle threading a Button (Sculpture), and the Statue of Ralph Kramden (Port Authority Building). Hotels in the Area: Bryant Park Hotel, Comfort Inn Times Square South, Courtyard Times Square South, DoubleTree by Hilton, Element Times Square West, Fairfield Inn & Suites, Holiday Inn Express New York City Times Square, the New Yorker Hotel (481 8th Ave), Wingate by Wyndham Midtown.